Jake's Review: I liked the one about the Dinosaurs better, this one is too much like the books we have to read for school. I did like that it was easy to read, had a lot of pictures and learned some interesting stuff. 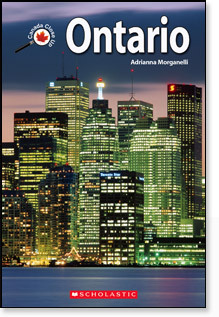 It would be a good book if you were working on a project about Ontario because it has a little bit of everything in it. But to just read its sort of boring. Mom, why are you shaking your head? Just so you know when she read about that lady who wrote books about early Ontario, she said the following (substituting a word for the bad one she used) Not that bleep bleep boring Susanna Moodie again - had way too much of her in College. Mom's Review: In my defense, and anyone who has taken College English, you have to read so much of Susanna Moodie and her sister that you hear their names and you start to shudder. Now back to the review, it is a good introduction to Ontario for kids in the 7-9 range. It would be a perfect book for a classroom library, for working on assignments, and public libraries. Included are various facts that all Ontario kids should know and those moving here should learn. A nice variety of illustrations, maps, etc to keep the kids reading and learning. Some of the cultural stuff is a little stereotypical and there was very little mention of Canadian literature, with the exception of bleep bleep Susanna Moodie and Catherine Parr Traill. A very useful glossary and index at the back of the book is especially helpful to students.